My wife and I were in a bind when our caregiver left to go to another country. It was difficult at first because we didn’t understand all the work that goes into placing the caregiver. Usually we used other agencies and they just send a girl; but this company had a nurse come out and really wanted us to be happy. 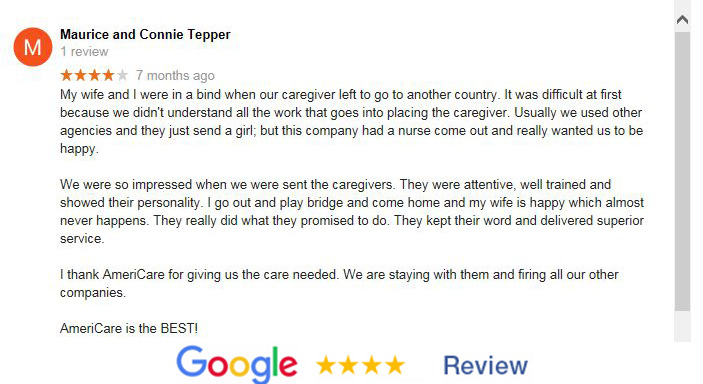 We were so impressed when we were sent the caregivers. They were attentive, well trained and showed their personality. I go out and play bridge and come home and my wife is happy which almost never happens. They really did what they promised to do. They kept their word and delivered superior service. I thank AmeriCare for giving us the care needed. We are staying with them and firing all our other companies.